Triple H - Plenty of action figures for "The Game" have been released over the years, but what makes this particular one special is that it's based off of Triple H's days in the "Attitude Era." Triple H is not made in his traditional wrestling gear, but street clothes instead. 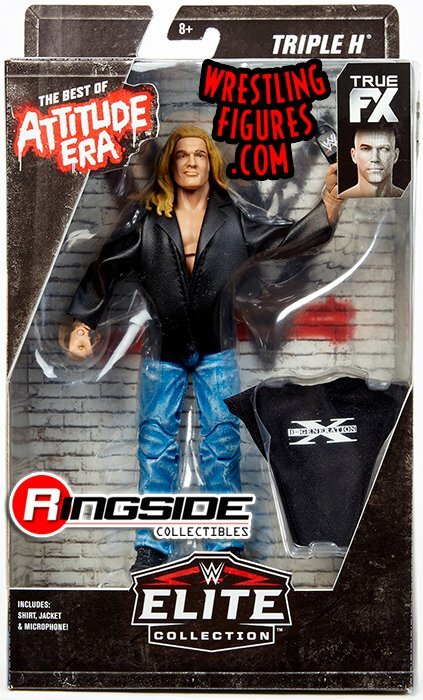 Recreated from his D-Generation X run in the late-90s, this new Triple H figure also comes with a removable shirt, jacket, and a microphone. This figure is part of Amazon.com's exclusive "Best of Attitude Era" Elite series. The likes of Chris Jericho, The Rock, and Stone Cold Steve Austin have received figure treatments in the past for this series, but Triple H will be joining the lineup later on this month. Pre-order information can be found here or here. 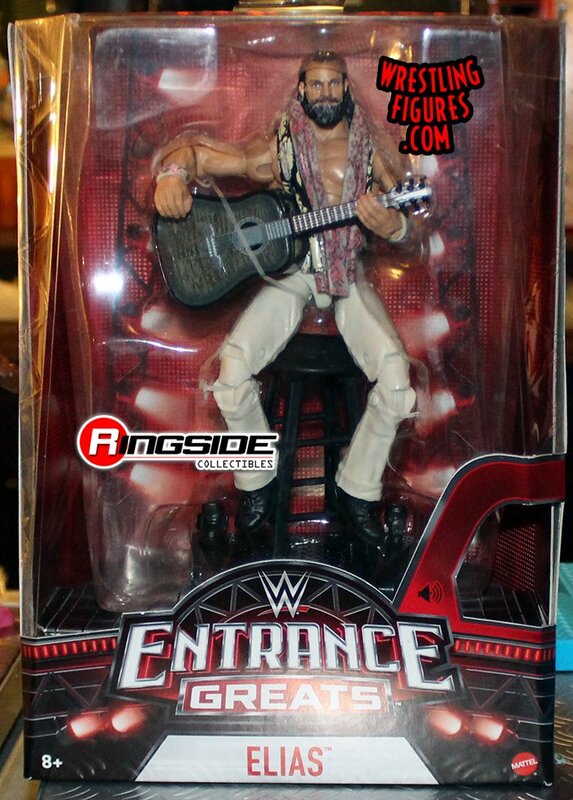 Elias - Mattel announced earlier this year that the Entrance Greats series will be coming to an end in 2019. The series is going out with a bang as the toy company went all out on recreating this Raw Superstar. 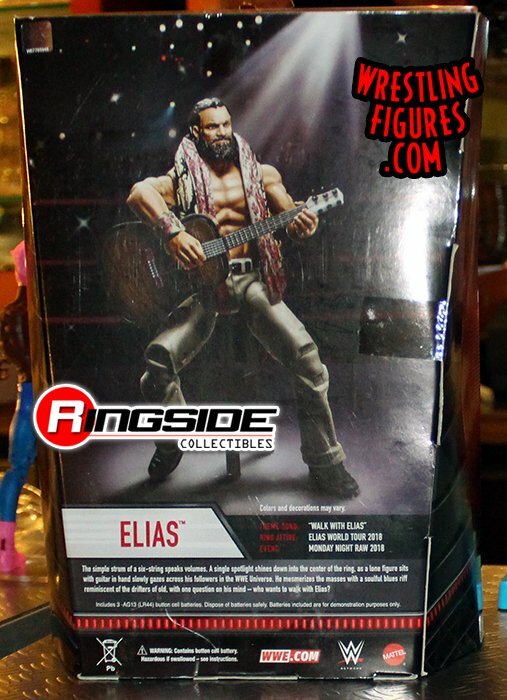 This is an Elite edition of Elias that sees him decked out in white ring pants. He also includes his signature barstool, scarves, and guitar. The guitar can also be broken into pieces for the most dire circumstances. As usual, this Entrance Greats action figure also includes a display stand with the wrestler's name on it. A button in the display stand will play the first thirty seconds of Elias' entrance music when it is pressed. The final Entrance Greats figure will be coming out in early-January, and it can be purchased here. Paige - Finally, a new Elite action figure of current SmackDown General Manager Paige was revealed during Mattel's recent visit to Wrestling Shop in the United Kingdom. Although Paige no longer wrestles, collectors can purchase this Paige figure in the ring gear that she had for her last match. It also includes a removable entrance jacket. The new Paige figure is coming out in 2019 and it will be exclusively available to Walgreens.